Adam Lanman and more than 200 other PhD students received summer travel funds. 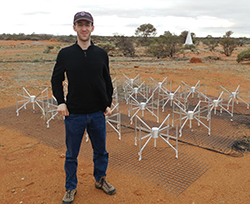 He went to Australia to help construct a radio telescope array used for astrophysical and cosmological research. The Doctoral Research Travel Grant provides supplemental funding for scholarly research travel that occurs July 1 - June 30. Students in their first through fifth years of study are eligible for a Doctoral Research Travel Grant. Applications from sixth year students will be considered if accompanied by a brief letter from the student’s director of graduate study or research advisor regarding how the research will assist the student in the completion of doctoral studies. For the Doctoral Research Travel Grant, grants up to $1,800 are used to match dollar-for-dollar awards for research travel from external or University resources outside of the Graduate School. Awards will be made on a first come, first served basis until funding is exhausted. Eligible students can receive only one research grant per fiscal year (July 1-June30), but can receive conference and research travel funding in the same fiscal year and are still eligible to apply for a Joukowsky Summer Research Award. All applications must be submitted using the UFUNDS online module. Research travel related questions should be submitted via email to [email protected]. Instructions for Research Travel reimbursement. Note: Students enrolled in degree programs in the Division of Biology and Medicine are not eligible for this program. The Joukowsky Summer Research Award Program was developed by the Graduate School in 2012 to provide additional funding for scholarly activities outside of Brown during the summer months. Students conducting research or traveling for other academic purposes during the summer months (May – August) may be eligible for this award. Academic purposes could include attending language programs, summer workshops or other activities. Doctoral students applying for summer research after the first through fifth years of study are eligible for the awards. Master of Fine Arts students in Literary Arts and Playwriting are also eligible to apply in their first year of study. Awards are provided from a minimum of $500 up to a maximum of $1,500 per summer. The application period is January 1 through the last day of February. The awards will be highly competitive as funds are limited, and will be based upon academic merit and projected impact on the research trajectory or academic training. Proposals will be reviewed by the Graduate School and award notifications will be sent to applicants by April 15. Research awards will be disbursed in May or June by special request or by travel reimbursement upon return from summer research studies. The Graduate School must receive applications on the UFUNDS site by the last day of February of the academic year preceding the summer research period. Late and incomplete applications will not be considered after the deadline. All applications must be submitted using the UFUNDS online module. Joukowsky research travel related questions should be submitted via email to [email protected]. Instructions for Joukowsky Summer Research reimbursement. Graduate students are required to register their international travel with International SOS. Students should take advantage of International SOS travel advice and services.